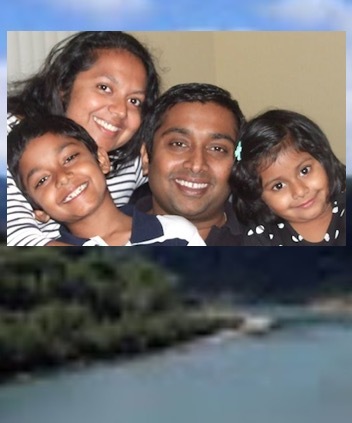 ABC7 is reporting, a water search is underway for an SUV that matches the description of a vehicle belonging to the missing Thottapilly family. A vehicle that plunged into the Eel River matches the description of a vehicle belonging to a Santa Clarita family that’s been missing since April 5., officials say. The Thottapilly family – 42-year-old Sandeep, 38-year-old Soumya, 12-year-old Siddhant, 9-year-old Saachi – vanished while on a road trip that was supposed to go from their Valencia home to Portland and back. Relatives say the family stopped communicating on Thursday and they’re concerned because the four were supposed to stop in San Jose on Friday for a quick visit with family or friends, but they never arrived. The Eel River runs parallel with the two-lane Highway 101 at that point. CHP Public Information Officer William Wunderlich from the Garberville office said there are similarities between that vehicle and the family’s car, including the color.